The dog days of summer are upon us! How is this possible?!? Per usual, summer is flying before my eyes. But, this one has some forceful tenacity to whip us into fall. Leslie is prepping for harvest, we are all getting kids ready for school, and we are looking into fall schedules and a quick August retreat for the gang. If you have any events that you would like to see come around in the fall, please drop us a line! We would LOVE to hear your ideas. -First Thursday Downtown is TONIGHT. 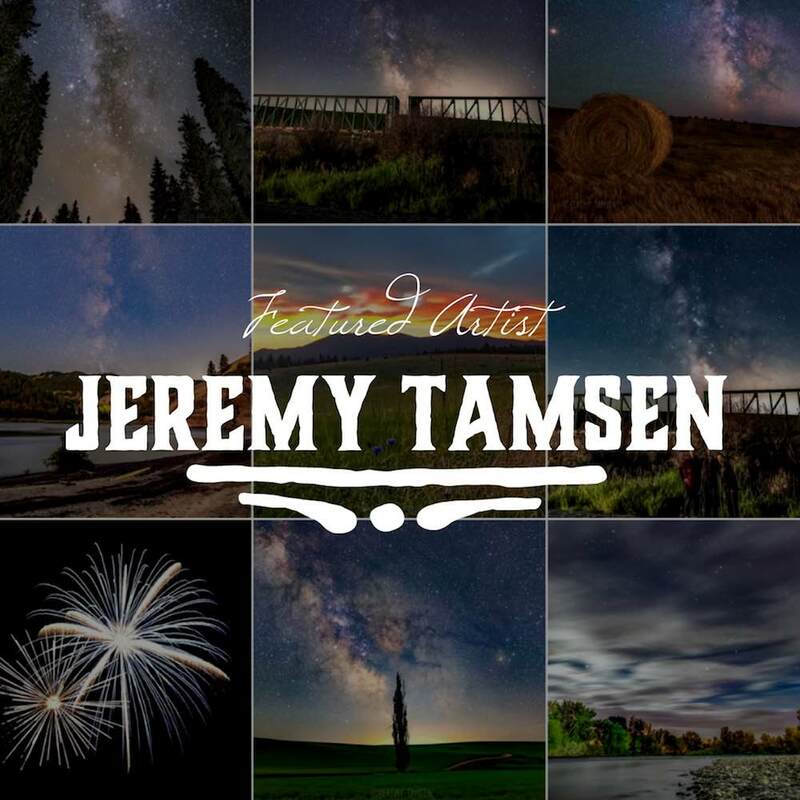 This month we are featuring Jeremy Tamsen, an artist not to miss! -Goathead Festival downtown is this weekend and Mere wants to see you all on your bikes. Riders, stop by Coiled Wine Bar for $1 off glass pours and slushies! -Happy Hour 'Red Fridays' in Garden City start this Friday. Come hang with Lauren, wear your red in support of our troops, and get $2 off Translations Red 3-6 pm. -We are looking forward to our second 'Garden Cinema' this coming Friday, August 3rd for 'Willy Wonka and the Chocolate Factory' as well as Friday, August 24th for 'The Goonies'. Piper pub will be vending and Coiled Wines will be available for purchase in addition to being on all VIP tables! -We are building a list of Harvest Music for Leslie to jam out to this fall. She wants you present in the cellar with her (in spirit)! Send your suggestions to kelly@coiledwines.com with the header "Harvest Jams" by August 15th to be included in her 2018 Harvest Soundtrack. -Check out our Featured Wine of The Month. This month, we take a look at the 2017 Dry Riesling and a tasty shrimp recipe from Aaron Wermerskirchen to pair. -Return of Bingo Night in SEPTEMBER (one more month off). -Save the date for Coiled Fall Release on Sunday, October 21st. -Coiled is taking reservations for HOLIDAY PARTIES! (I know, we aren't fully ready either... But, it's happening!) Get your spot now before the dates fill up! Email Kelly@coiledwines.com for more info. -Not in Club? Sign up and get guaranteed access to Coiled's wines—especially those that sell out quickly. Reach out to ME to sign up! Donate a new backpack to PAL! Boise PAL (Police Activity League) is currently raising funds and collecting donations of new backpacks🎒 for local youth. We would love YOUR help in making this happen. You can Stop by Coiled Wine Bar or Coiled Wines TastingRoom to donate backpacks or make a monetary contribution to the cause. All donations are tax-deductible! Make your contribution by August 6th and get $1 off any glass pour or slushy! Coiled has donated a backpack per employee. We challenge you to do the same! We are welcoming a new artist, Jeremy Tamsen, for the month of August in the downtown spot. Jeremy and his 'stellar' pieces will be present for a "meet the artist" experience on First Thursday, August 2nd, from 5-9 pm. Jeremy Tamsen uses several techniques, including long exposures, and multiple exposures, to unveil detail in the night sky above us. A special collection of 16"x11" metal prints will be on display, along with select other pieces from Jeremy's recent work. While galactic views are his specialty, landscapes and iconic structures are his passion. Browse his gallery ahead of time HERE - and come ready to view some stellar work! The Idaho Botanical Garden is bringing back the summer drive-in atmosphere with Garden Cinema. Bring a blanket and come out to the Garden as we host a variety of movies on the giant-outdoor-big-screen. Come early to enjoy a picnic dinner in the Garden. Vendors on site offer dinner, adult refreshments, and movie snacks. Gates open at 8:00 pm. Movie starts at dusk. All those participating by bike that stop by Coiled get $1 off glass pours! See you on Saturday, August 4th! Send us your picks for 'Leslie's Harvest Jams 2018' by August 15th. To add yours to the list email Kelly HERE! We are in our last month of Slushy Sundays at the tasting room in Garden City! Come, September, the machine will take a rest in the downtown location. You can still get them any Tuesday-Saturday at the downtown Wine Bar, as well. This months featured flavors are Strawberry Chablis and Banter Sangria! In Leslie's words: "It's prime Riesling drinking time!" Saute shrimp in tbsp olive oil and season with salt and pepper. Pull out shrimp once cooked and set aside. In the same pan, saute the squash, garlic, salt, chili flakes, and leeks until squash has some color and is cooked through. Add chard and wilt, deglaze with lemon juice and white wine. Cook down for 30 seconds, then turn off the heat and add tomatoes and butter. Stir around until butter is melted, put into a bowl. Heat pesto with shrimp and top on veggies. Then garnish with parmesan and pour a generous glass of 2017 Dry Riesling. Enjoy! Both the Coiled Wine Bar and Tasting Room can be rented for your special event and holiday parties. Contact info@coiledwines.com for further information. Join me. Sit down and pour a drink. As harvest approaches, I always feel a nagging need to get everything in its place in anticipation of the many curveballs to come. I am ahead of schedule this year in all things and it feels wonderful. The past twelve months have been the hardest of my life, and as a result, I seem to be obsessive about creating order anywhere I can. We humans are funny beasts. I attended a vineyard seminar this afternoon, sponsored by the Wine Commission. They have hired a vineyard consultant from Paso Robles, in an effort to take our vineyard practices to the next level and to provide support for new growers. As we were discussing various stages of vine and grape development, and the necessary protocol along the way, I couldn’t help thinking of the many developmental parallels between vines and humans. Like us, vines and developing grape clusters are subject to very vulnerable periods where all hell can break lose if conditions are not right. Most recently, The Snake River Valley appellation suffered greatly from the cold spell in January 2017. The fruit we did get was terrific, but many vines simply said no. In the case of my block of Riesling, the vineyard management could see that the vines would produce fruit, but might collapse from the stress, causing long-term damage. As a result, they made the call to cut the vines back, leaving only a bit of the trunk, with the plan of growing new cordons from buds on that trunk (shown above). The vines are now thriving this harvest with especially heavy yields, due to a “rebound” effect from being cut back. A lot of fruit will be thinned, to put the vine back in balance so it can properly ripen its bounty. Ironically, I feel like my family has gone through the same kind of year. I think I might have been a Riesling vine in my past life. Anyway, as our oldest son was approaching teen-hood a year ago, I was focused on how to help him anticipate and survive a uniquely vulnerable phase in his development. It did not occur to me that we, as parents, were on a precipice all our own. Call it a mid-life crisis, or simply a reckoning by our inner-beasts requiring some repairs for damage done over the past few challenging years. Whatever you call it, it was a force, and it knocked us to our roots. Thankfully, no sports cars or tawdry affairs were required to get us through this vulnerable mid-life phase. Long story short, Ross and I are both still standing, and standing next to each other with a whole new appreciation for one another. As I visited my Riesling rows today, I felt so grateful for our combined comeback. Our lives are packed with so many choices it is overwhelming. Most do not have life-changing implications, but some do. Do we hold on or let go? Or both at the same time? This idea of simultaneously holding on and letting go has really captured my attention lately. It is a hard concept to grasp. I “get it” the most when I am in yoga, practicing the bow pose. If I hold on for dear life, I generally lose my balance because I am not breathing properly and allowing my body to feel its way through. If I just dive in without adequate commitment, there isn’t a chance in hell. However, the magical steadiness and calm that comes when both principles are at play draws me back to my mat again and again. Intellectually, we all know that this tension of tenacity and surrender is always at play in our lives, but I don’t think we are always aware of it happening. I think that is a good thing. If we had to think about it at all times, we probably would not get it right. Maybe it is best to simply cherish the moments when the fruits of this balance present themselves. My family recently attended a family wedding in Santa Barbara that was profoundly meaningful to me. When Ross and I started dating, I eventually met both of his sisters and their 5 boys. All five nephews were at our wedding, spanning the ages of 4-11. Now, eighteen years later, the four year old is in the Peace Corps in Africa, and the 11 year-old just married his perfect match. This wedding was the first our boys have attended. Listening to the ceremony with all of Ross’ family was the ultimate reward for holding on to the roots and letting the rest go to ensure a healthy and robust future. Is it just me or do grapevines hold all the answers to life?